Meadow Garden is one of Georgia’s oldest dwellings. This national historic landmark is a quiet and inviting oasis in the midst of the industrialized city of Augusta, Georgia. Meadow Garden was the home of George Walton, one of the youngest signers of the Declaration of Independence. Come and visit this beautiful treasure! Guided tours are available Tuesday-Saturday, 10:00 a.m. until 4:00 p.m. with the last tour beginning at 3:15. The home features 18th and 19th Century American and English furnishings, porcelains, paintings and primitive household equipment. Pardon our progress! 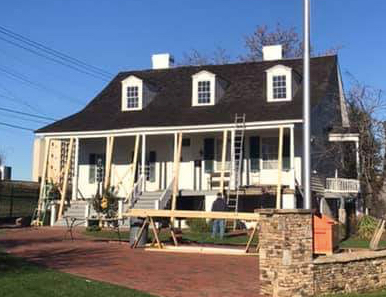 Meadow Garden is open regular hours during this work to restore the porch on our historic house museum. Please come for a tour!